They need to easily find your names, titles, companies, start and end dates, education and contact details. You need to get all of the key information onto the first page so that it can be found quickly and easily. If you are aiming to relocate, stating that fact might increase your chances. Recruiters will look for a match between your job title and the position in question. This is a 2-4 line summary that shows how well you fit the needs of the job. 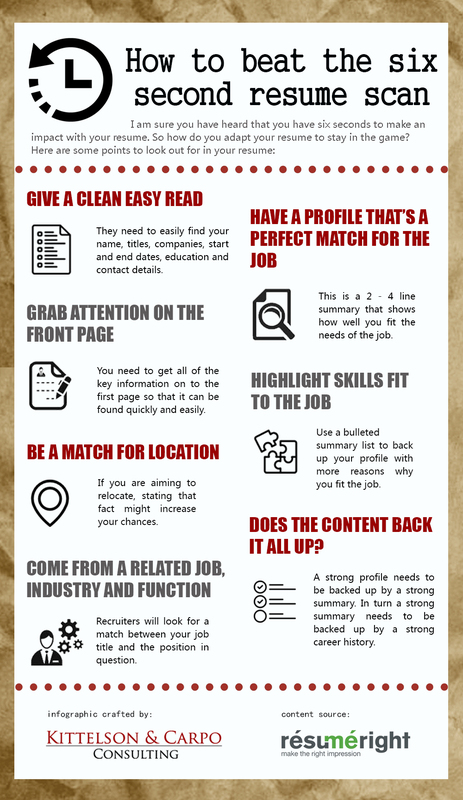 Use a bulleted summary list to back up your profile with more reasons why you fit the job. A strong profile needs to be backed up by a strong summary. In turn a strong summary needs to be backed up by a strong career history.